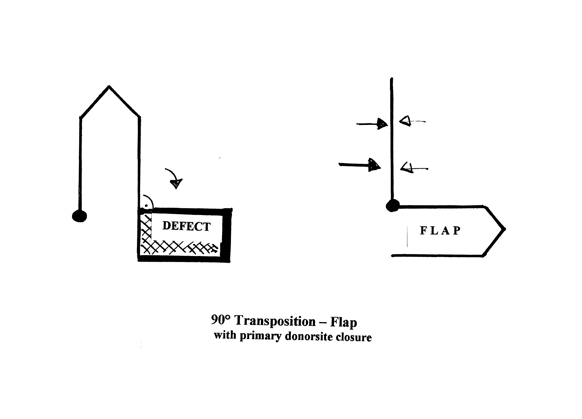 1) Transposition flaps are usually random pattern flaps. 2) The ratio of length to width depends on the vascularisation of the flap region. 3) The flap is safer when you raise the flap near the basis as a fasciocutanous flap. 4) Primary donorsite closure is preferable but only when there is little tension. 5) Donorsite closure with skin grafts avoids tension on the flap. 6) The direction of the primary donorsite closure should be 90° to the flap axis. 7) Moderate longitudinal tension on the flap is tolerable – transversal never. 8) Cavities underneath flaps should be avoided and filled with vascularized tissue. 9) Compression on the flap may cause necrosis and delay of the healing process. 10) Hematomas may destroy flaps – therefore use small drainage tubes. This flap brings a lot of tissue to the defect. The primary donorsite closure is the limiting factor. No tension on the flap when closing the donosite in 90° direction. 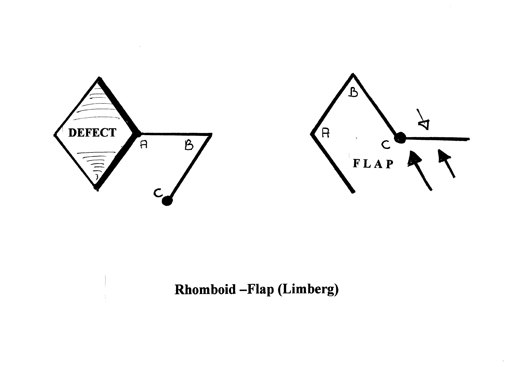 In the limbs antegrade or retrograde flaps are possible. Donorsite closure proximal to the flap may cause venous problems. Advantage in joint areas: postoperative expansion is possible without contraction. 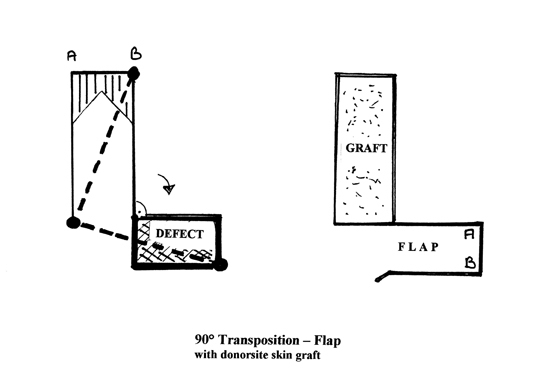 Closure of large defects needs a combination of flap and graft. This flap is universally available but not easy to plan. The flap must be longer than the defect. Measurements of the longest axis is mandatory. Hematoma underneath the flap may destroy the take of the skin graft. Very versatile flap with many variations in all directions. Primary donorsite closure without tension on the flap. Excellent vascularity and safe healing. Ideal for small reconstructions in the face.